Face it – the more advertising people receive, the more they hate it. As a result, to reach today’s information savvy customers, content marketing trumps advertising. 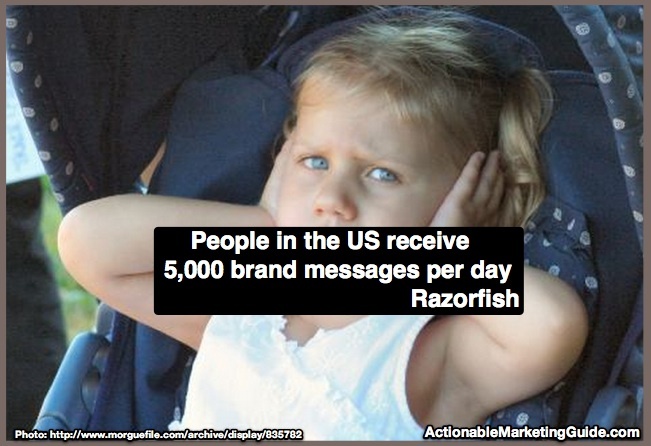 On average, people in the US receive 5,000 brand messages per day according to Razorfish. While I’m not sure whether the signs and notices in store windows and on trucks on Sixth Avenue count, I’m sure the out-of-home (aka OOH) messages in the subway and on taxi tops do. In New York City, there doesn’t seem to be a blank wall or piece of paper that doesn’t have some paid brand message. The rent by the hour, city bicycles are branded by Citibank and buildings where outside work is being done are wrapped with advertising. If you live in an urban area, you probably receive more promotional messages than average. 1. 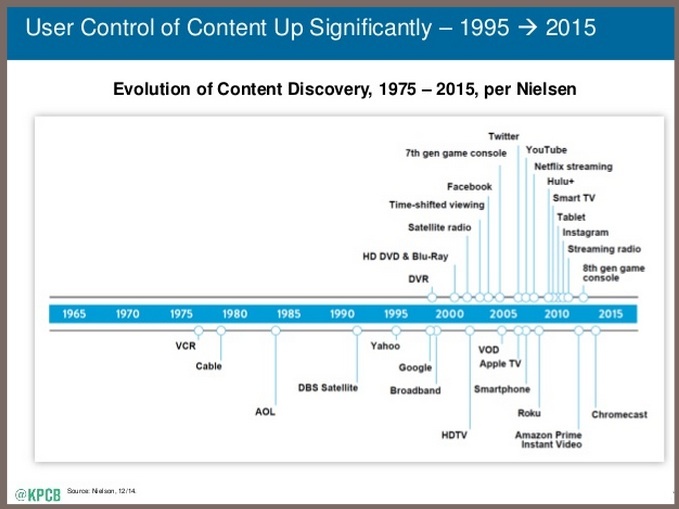 Consumers have greater control over the content they choose to consume, a point Mary Meeker made in her 2015 Internet Trends Report. It’s increasingly difficult to aggregate and reach your target market. The average US TV home receives 189 TV channels. 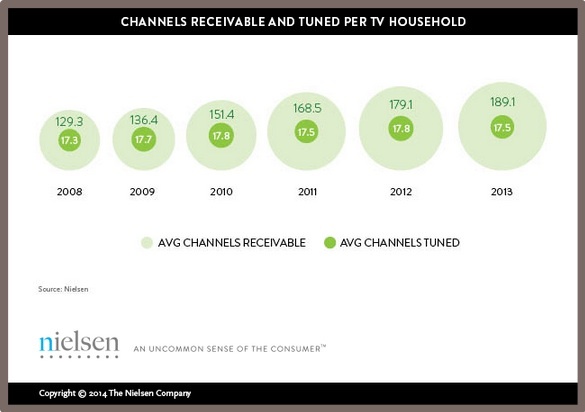 Yet despite this variety consumers consistently watch an average of 17 channels according to Nielsen. BTW—This behavior applies to other forms of content such as websites, email newsletters and apps. Bottom line: You MUST be in your prospect’s inner content circle. 2. 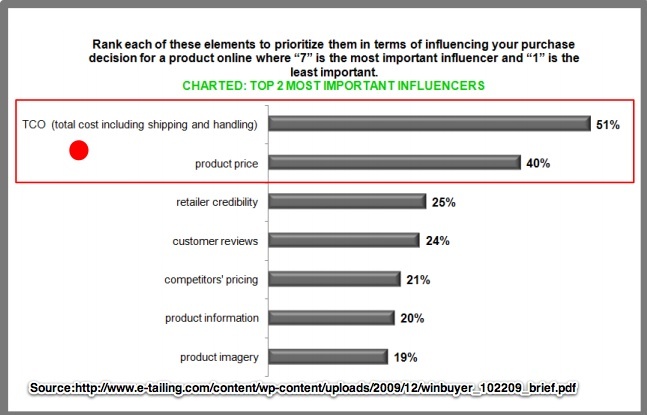 Consumers research purchases before marketers realize that they’re in market. 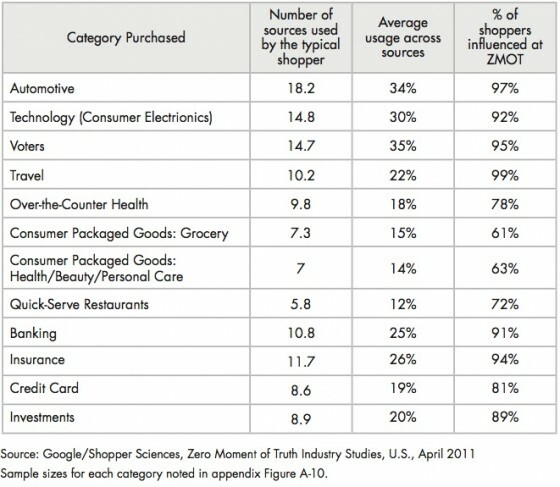 Shoppers checked 10.4 sources of information to make a purchase decision in 2011 according to Google’s research. Purchasers start their research process often before marketers realize they’re in market. B2B buyers are 57% of the way through the process. Consumers tend to be further along. Here’s additional information on the B2B purchase process. You must provide the information your prospects seek where and when they’re looking for it. This may not be when you’re at work or are advertising. 3. Consumers actively seek the best price before purchasing. This is the advertising exception: Consumers will find the best price before they pay for a product by checking their smartphone or targeted app. 51% visit 4+ sites before finalizing a purchase according to the e-tailing group. While you may get another chance to capture a sale, the profit margin will be lower. Chances are that you’re less likely to turn this type of customer into a loyal fan. 50% of US consumers will do anything to avoid ads. 75+% of US consumers hate hearing or seeing ads multiple times. 65% of US consumers use a DVR to skip ads. What do consumers want instead of advertising? 86% of US consumers value brands that are useful over those that have interesting advertising. Based on this data, the path is clear: Content marketing overcomes the barriers advertising raises causing consumers to ignore them. Provide your prospects, customers, influencers and the public with useful information they need. 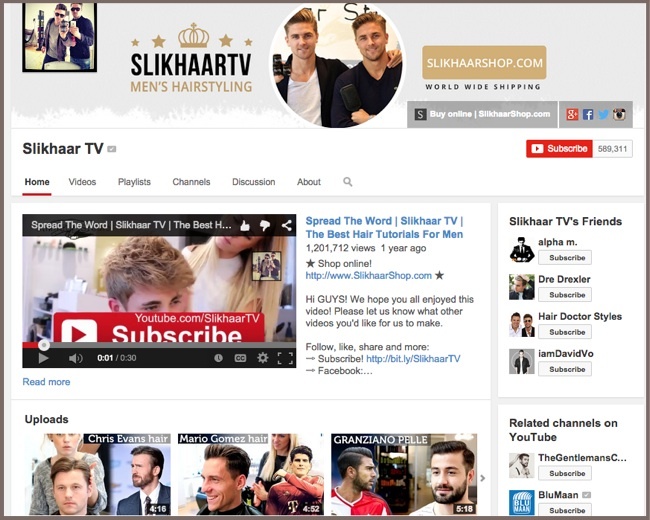 Content breaks through when advertising doesn’t. In addition to FOMO (fear of missing out) that prospects get on Facebook and Instagram, potential customers use YouTube, the second largest search engine, and Pinterest. This is particularly true for Food and DIY topics but it also works for other interests. Prospective buyers have specific information and product needs. They’re laser focused when they seek relevant information. 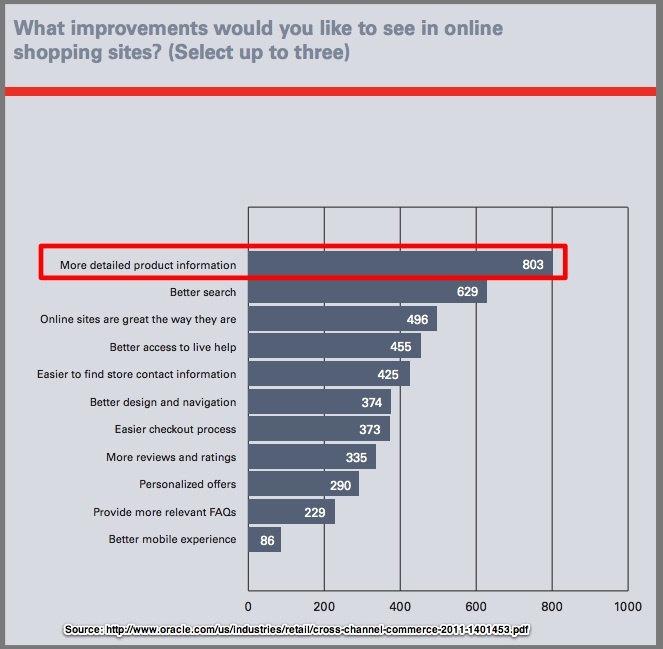 Oracle research from 2011 shows that the biggest thing customers seek online is product information. Show your product in the context that they’ll use it. Make it easy for them to choose your product. Think multimedia. Include photographs, technical charts, and videos. Don’t make shoppers guess what your product will look like in their life. Just because your business has deep pockets to pay for advertising, doesn’t mean that your prospect trusts you. Don’t take my word for it. 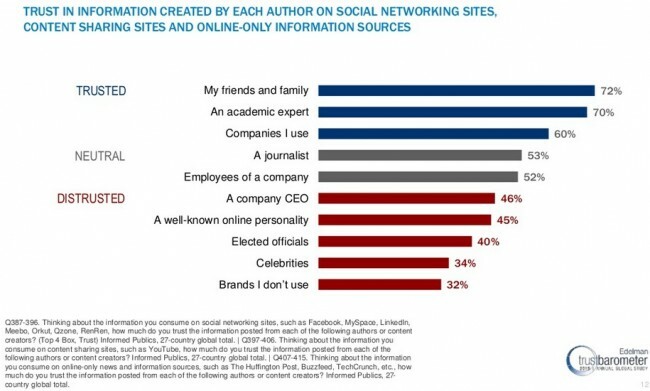 Check Edelman’s Trust Barometer. Get your employees, influencers and customers to help you create useful content that your target market trusts and actively seeks. Take a page from Amazon’s playbook: Ask your customers for their input. It’s no longer just Amazon but an array of offerings such as TripAdvisor and AirBnB. Use your content marketing to create an augmented product that enhances its value for your customer. Not only does it attract new prospects, but also it can retain existing ones. Offer prospects and customers recipes and patterns. Take a page from food and DYI products that have done this for years. Supply useful charts and checklists to help your customers. Go one step further by making the information so useful that consumers post it as a reminder for future use. Don’t underestimate the value of detailed assembly instructions. For example, we recently bought my mother a new bed that required assembly. Unfortunately, despite being sold through Amazon, the instructions were minimal line drawings. Result: My husband spent an extra 2 hours taking it apart and reassembling it! Skip the promotion. Cut to the chase by showing prospects and customers how to use and style your product to make them look good and their lives easier. Don’t assume that your content is done once you’ve finished writing it. It needs more. Give your content the extra push it needs to stand out and get found by the people who seek it. Dress your content up with images. People see images faster than they do text. Focus each piece on one keyword. Search is still your safety school when it comes to findability. Format content for ease of readability. Skip the TH;DR (too hard; didn’t read). Never assume that promoting the content you worked hard to produce should only be shared once. Need help? Here are 50 ways to re-promote your content. 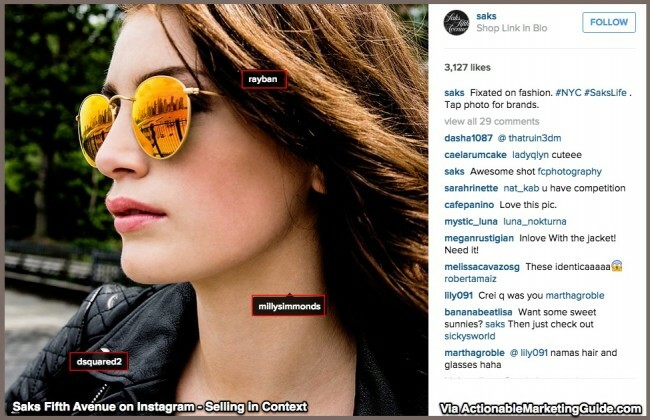 Take a page from advertisers—impressions matter. They believe that 5 to 7 impressions are needed to make an impact. Don’t assume that if a prospect didn’t see your content when you first published it, that’s it. Reformat your content marketing so that’s contextually relevant to the platform where you’re placing it. You wouldn’t use the same accessories to wear to a special dinner date as you would to go run errands. Re-imagine your information to keep it fresh. (Hat tip to Ann Handley!) 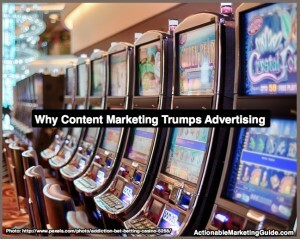 This is one way that content marketing has power over ads, which can be too expensive to change or modify. Your content doesn’t have to get stale! 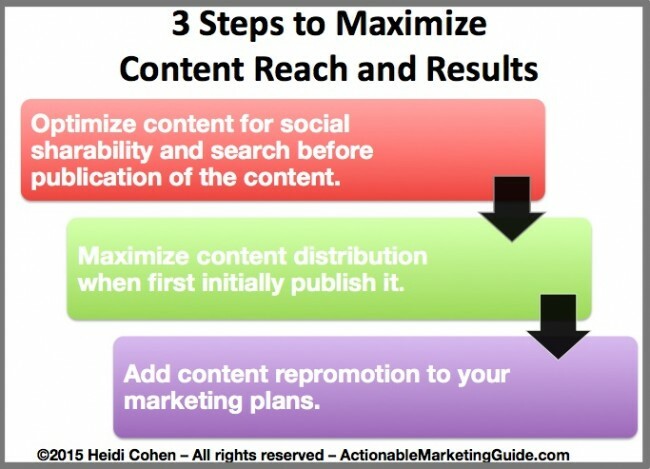 To maximize your content marketing, measure your results and make fixes where appropriate. Also, continue to test different presentations and placements. When it comes to the advertising versus content marketing dilemma, content marketing helps you overcome most of the obstacles that advertising presents. That doesn’t mean you shouldn’t use advertising to supplement your content marketing and help you to reach a broader audience – especially through native advertising and paid search. 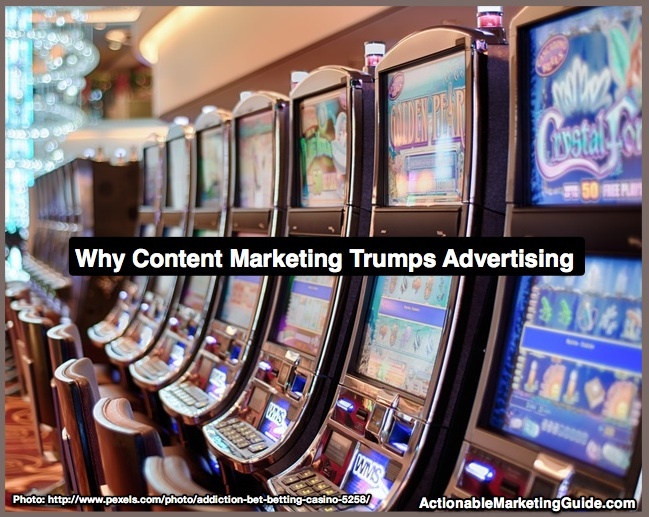 Which do you think is better, content marketing or advertising? Tags Mary Meeker, Nielsen, Razorfish. Bookmark the permalink.